Main objective of any pharmaceutical scientist is to develop drug delivery system that is safe, effective, stable, having good patient compliance and fulfill the requirements of customers. Lead to a great interest of research to develop the drug delivery system that will enable to supply drug «on-demand» basis. These «stimuli-responsive and intelligent» systems have been designed to deliver the drug on various times or at various sites in the body, according to a stimulus that is either endogenous or externally applied. This paper aim to review various researches in the field of self regulatory drug delivery systems in tabular form so one can utilize these finding for further development of in intelligent drug delivery systems. Various physicochemical principles and chemical schemes have been applied by researchers to get release pattern of drug as per requirement of body. Such devices can be used for intelligent drug delivery needed for the treatment of many diseases like diabetes. This type of intelligent system firstly sense the signals caused by diseaseà judge the magnitude of signalsà and then release the drug in direct response. In this article we have discuss various innovations in the field of self regulatory drug delivery Systems and suggest that here is a lot of research scope in this field. El objetivo principal de cualquier científico farmacéutico es desarrollar un sistema de administración de fármacos que sea seguro, efectivo, estable, que cumpla con los requisitos del paciente y cumpla con los requisitos de los clientes. Llevar a un gran interés de investigación para desarrollar el sistema de entrega de medicamentos que permitirá suministrar medicamentos «a demanda». Estos sistemas «sensibles a estímulos e inteligentes» han sido diseñados para administrar el farmaco en varios momentos o en varios sitios en el cuerpo, de acuerdo con un estímulo endógeno o aplicado externamente. Este artículo tiene como objetivo revisar diversas investigaciones en el campo de los sistemas autorreguladores de administración de fármacos en forma tabular para que uno pueda utilizar estos hallazgos para un mayor desarrollo de sistemas inteligentes de administración de fármacos. Los investigadores han aplicado varios principios fisicoquímicos y esquemas químicos para obtener el patrón de liberación del fármaco según las necesidades del cuerpo. Dichos dispositivos se pueden usar para la administración inteligente de medicamentos necesarios para el tratamiento de muchas enfermedades, como la diabetes. Este tipo de sistema inteligente primero detecta las señales causadas por la enfermedad, juzga la magnitud de las señales y luego libera la droga en respuesta directa. En este artículo, hemos discutido varias innovaciones en el campo de los sistemas autorreguladores de administración de fármacos y sugerimos que aquí hay mucho campo de investigación en este campo. 1.Intelligent drug delivery systems are capable to deliver the drug as per the physiological needs. 2.This system help to maintain the plasma drug concentration within therapeutic range. 3.Localized delivery of drug to particular compartment (targeted site) can be achieve. 4.Preserve the drugs that are rapidly destroy, enhance the stability. These are also known as externally controlled system or pulsatile systems . These system employed external triggers to deliver the drug such as magnet, temperature, ultrasound, electric effects etc. These are also known as self regulated drug delivery systems or responsive systems. Rate of drug release controlled by feedback information without external intervention. These are uses various approached such as pH-responsive, glucose responsive, thermo-sensitive, urea responsive, inflammation sensitive etc. Enzymes used as triggers in the design of smart drug delivery systems and gain attentention due to its its unique superiorities, such as substrate specificity and high selectivity15)-(18. Since enzymes (such as glycosidases, lipase, phospoholipases or proteases) are related to almost all the biological and metabolic process, they can be use to get enzyme-mediated drug release17. The ultimate goal for diabetes mellitus is to control the blood glucose level by insulin delivery and minimized the long-term diabetic complications. Currently main therapy is to administered insulin through subcutaneous injection for diabetes patients. Two or three injections are required a day to maintain the normal blood glucose level. Because this method is burdensome and invasive to living organisms, the patient’s situation would not be good regarding the quality of life. Therefore, an electrical and mechanical controlled insulin pump that injects insulin automatically into the bloodstream has been developed. An insulin pump constructed with polymer materials has been studied. Many researchers working on deliver insulin by smart device. A GlucoWatch™ biographer is non-invasive, watch like device that measures glucose. A plastic part of Gluco watch that snaps into the biographer and sticks to the skin. Automatic reading every 10 min up to 13 hrs is taken by it. Gluco watch presently takes the lead among user-friendly techniques aimed at glucose monitoring. This system is based upon the principle of reverse iontophoresis. -a. AuroShell: Thermosensitive gold nanoshell are prepared by Nanospectra Biosciences for Intracranial tumors40. Current researches in the field of to intelligent drug delivery summarized here in tabular form (Table 1). Table 1: current researches in the field of the intelligent drug delivery. Zhang et al., (2018) Mesoporous silica nanoparticle-based intelligent drug delivery system for bienzyme-responsive tumour targeting and controlled release This paper proposes a novel type of multifunctional envelope-type mesoporous silica nanoparticle (MSN) to achieve cancer cell targeting and drug-controlled release. In this system, MSNs were first modified by active targeting moiety hyaluronic acid (HA) for breast cancer cell targeting and hyaluronidases (Hyal)-induced intracellular drug release. Then gelatin, a proteinaceous biopolymer, was grafted onto the MSNs to form a capping layer via glutaraldehyde-mediated cross-linking. This system presents successful bienzyme-responsive targeting drug delivery in an optimal fashion and provides potential applications for targeted cancer therapy.45). Intelligent drug deliver means deliver of drug to selectively to targeted cells and tissues while leaving other healthy parts of the body untouched. 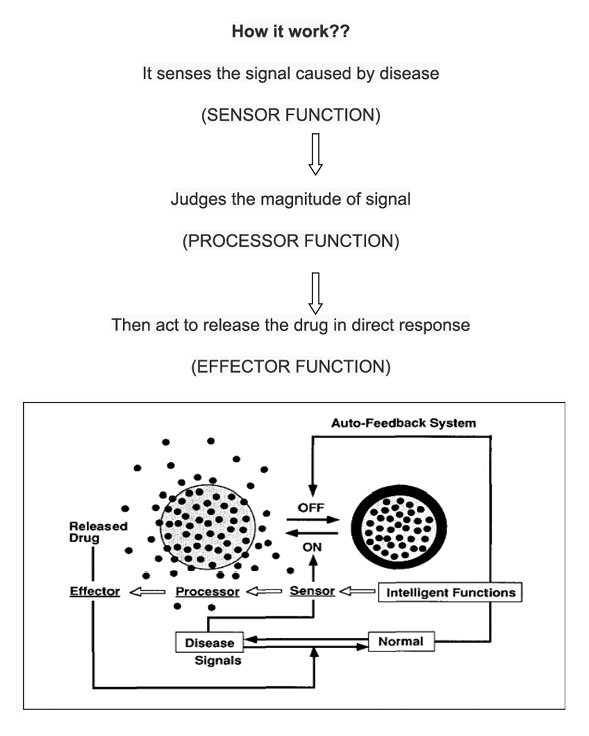 Although research working on many areas to improve drug delivery to targeted site and therefore drug delivery systems gained wide attention in biomedical research due to their potential to significantly reduce the side effects of drugs and control the concentration and location of active drugs released in the body over long periods of time. Clearly new strategies for preparing drug delivery systems are capable of selectively releasing drug at targeted site will help improve many of the current problems in drug therapy. The authors are thankful to the Managements of School of Pharmacy, LNCT University, and Bhopal for their unconditional support in the field of research and developments.